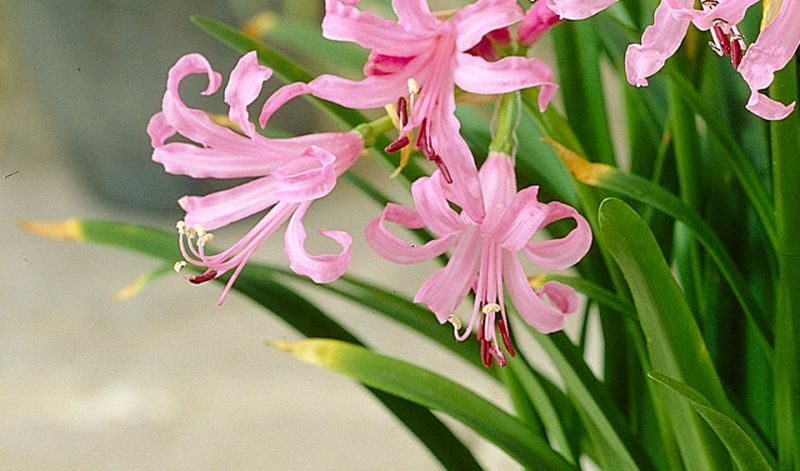 Nerine bloom as a cluster of up to 12 curly, 3" / 7 cm long, trumpet-shaped flowers on a leafless stem. The crinkled petals give them a sparkling crystaline appearance. The bowdenii species, by far the most popular cultivar, flower for several weeks at the end of the growing period when the foliage has almost withered. Water well while the plants are growing during the Summer. Keep them fairly dry during Winter dormancy when grown outside in warmer climates or when grown in pots in colder climates. They are great as cutflowers: their keeping quality is excellent.